Rebecca Fox, now 31, first worked in the service industry as a 13-year-old at this New Jersey diner, which is now closed. When New Jersey raised its minimum wage at the start of the year, low-wage workers across the state cheered. But not Rebecca Fox. The 31-year-old waitress earns the same $2.13 per hour that she has made for the past 18 years. That’s more than $6 an hour less than the state’s minimum wage of $8.44 an hour. In recent years, efforts to raise the minimum wage have gained new momentum. Cities and states across the country have raised their wage floors, in some cases to $10 an hour or more. But even in states that have raised their minimum wages, tipped workers are often still stuck earning $2 or $3 an hour. Nebraska, for example, last year raised its minimum wage to $9 an hour while leaving the tipped wage at the federal minimum of $2.13. 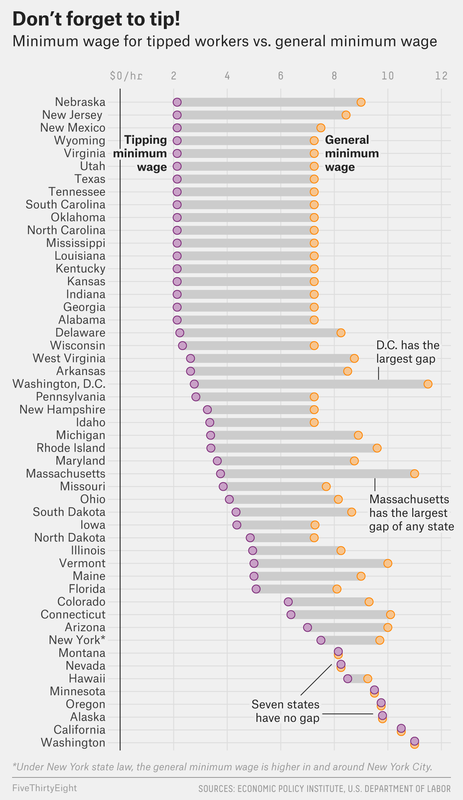 The gap is even wider in Massachusetts, where the minimum wage is $11 an hour and the tipped wage is only $3.75. Activists, who initially focused on untipped fast-food workers, are starting to turn their attention to tipped workers. Maine last year voted to become the eighth state to eliminate its tipped minimum wage, meaning that once the law fully takes effect, all workers will be subject to the same wage floor. In 2013, the Restaurant Opportunities Centers United, a worker-advocacy group, launched a campaign calling for policymakers to dismantle the two-tiered wage system. The organization is working to get legislation passed in Massachusetts, Washington, D.C., and other states and localities, according to Saru Jayaraman, a co-founder of the group, who said the nonprofit is planning to push several states to move legislation on Feb. 13. But advocates worry progress could stall under President Trump, especially given the nomination of restaurant CEO Andrew Puzder for labor secretary. Puzder is an outspoken critic of raising the minimum wage, which he argues could lead to lost jobs. The restaurant industry has been a leading opponent of efforts to raise or eliminate the tipped minimum wage. Fox works at the Princetonian Diner in Princeton, New Jersey, five nights a week. During the day, she assists adults with disabilities at an occupational therapy center, a job that pays just a bit more than the minimum wage. Her husband works as a union carpenter. But despite working three jobs between them, Fox said the couple, who have one daughter, are barely squeaking by. 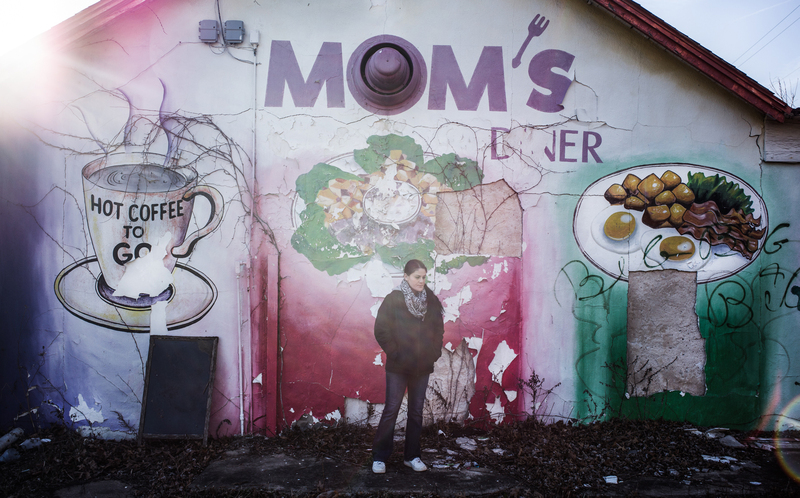 “It’s very expensive to live in New Jersey; it’s hard to survive,” she said. Allegretto’s research with the Economic Policy Institute, a left-leaning think tank, found in 2014 that in states where the tipped wage is $2.13, the poverty rate was 14.5 percent for all tipped workers and 18 percent for waiters and bartenders, compared with 7 percent for non-tipped employees. Of the roughly 4.3 million tipped workers in the U.S., almost 60 percent of them — 2.5 million — are waiters and bartenders, according to Allegretto’s research. Around 67 percent of all tipped workers and 69 percent of servers and bartenders are women. EPI’s research found that 24 percent of waiters and bartenders are parents, and 16 percent of women in those jobs are single mothers. Around 47 percent of tipped workers and 50 percent of waiters and bartenders were members of families that earn less than $40,000. In New Jersey, where Fox works, the average annual salary for waiters and waitresses was $23,100 in 2016. When the tipped minimum wage was established in 1966, it was set at 50 percent of the applicable minimum wage rate. At the time, the minimum wage was $1.25, which made the tipped wage around 63 cents, and it was due to increase whenever the minimum wage went up. In 1996, however, President Bill Clinton struck a deal with Congress that raised the minimum wage while leaving the tipped minimum at $2.13 an hour. It has remained frozen at that level ever since. The restaurant industry relentlessly opposes efforts to increase or eliminate the sub-minimum wage for tipped workers. The National Restaurant Association, an industry advocacy group, argues that an increase is unnecessary because most waiters already earn well above the minimum wage once tips are factored in. Shannon Meade, the association’s director of labor and workforce policy and government affairs, said the group’s research has found that tipped workers are “among the highest-paid employees” in most restaurants and typically earn between $16 and $22 an hour. “The practice of tipping and the opportunity to earn more than the federal minimum wage has always attracted employees to the restaurant industry,” Meade said. But labor advocates noted in interviews that such averages include high-end restaurants, where tips can help waitstaff earn comfortably middle-class salaries. At diners and other less-expensive establishments, tips can be much lower. And activists point to evidence that tips can be influenced by factors such as a server’s race, age or physical attractiveness. Although the minimum wage is one most researched topics in economics, the tipped wage has not been as thoroughly investigated. The research that has been done has reached conflicting conclusions. A 2012 paper from economists at the IZA Institute of Labor Economics, a German research organization, found that increasing the tipped minimum led to higher earnings but lower levels of employment. Allegretto has found wage hikes raise earnings without reducing employment. And a recent working paper by Census Bureau economist Maggie R. Jones found that in areas where tipped wages are higher, employment actually increases, at least up to a certain point.1 But Jones also found that raising the tipped wage doesn’t increase workers’ earnings because tips fell when wages rose. Not all workers are sold on the idea of raising the tipped wage. A little over two years ago, Steve Marandola, 50, moved from New Jersey to Bellingham, Washington, where the tipped wage is now $11 an hour. Marandola has worked in the restaurant industry for 30 years and currently works at an Applebee’s. According to Marandola, prices have risen since the wage went up, and both customers and the business are reacting. He still receives tips, but they’re much lower than they once were, and nobody at his store works more than 20 hours a week. He says some restaurants are even experimenting with replacing waiters with tablet computers. CORRECTION (March 13, 1:40 p.m.): An earlier version of a chart accompanying this story misstated minimum wages for two states. Michigan’s minimum wage is $8.90 per hour, not $9.80. Iowa’s minimum wage for tipped workers is $4.35, not $4.25. Jones found that when the tipped wage exceeds about $6 or $7 an hour, employment does begin to decrease.